Reimagine Everything: Have You Ever Thought About How Your Car Fits You? Like shoes or jeans, cars are not guaranteed to fit forever. As we age and change, chances are that the vehicles we drive will require some adjustments to stay comfortable for us and at their peak of safety. Our height, girth, flexibility and vision are all subject to fluctuations as the years pass, and lots of us don’t realize that each of these can affect how well our cars fit us. Mirror positions that once gave us the maximum rear and side views might need realigning, for example, or we might be crowding the steering wheel or reaching too far for the pedals. Fortunately, we can turn to a free community educational program called “CarFit,” which offers older adults the opportunity to check how well their personal vehicles fit them. 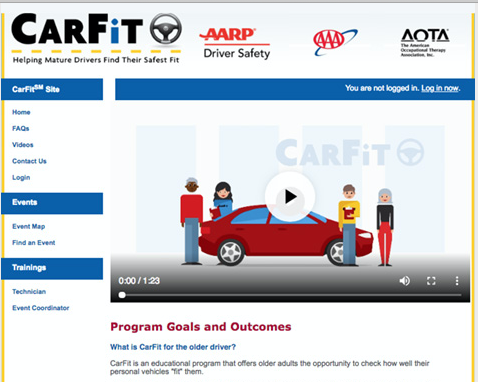 Created in 2006 by AARP, the American Automobile Assn., and the American Occupational Therapy Assn., CarFit promotes continued safe driving and mobility among older drivers. At local events all over the country, CarFit technicians will check out your vehicle to gauge how well its features mesh with your maximum safety. They will also make recommendations about adjustments, but they always leave up to the driver which ones to make. In addition, they’ll suggest proper mirror alignments to minimize blind spots, especially important for lane changes. They will check for good foot positioning on the gas and brake pedals because if a driver is reaching with his or her toes to press on the pedals, it can cause leg fatigue and slow reaction times. And they will see how close you are sitting to the steering wheel — anything closer than 10 inches puts the driver at risk of serious injury. A complete CarFit examination takes about 30 minutes. Individuals wishing to take part in a CarFit Checkup can visit www.car-fit.org/carfit/RegisterCarFit to look at the calendar of upcoming events. If there are no events listed near you, please check back to this site for new postings. One-third of drivers had at least one critical safety issue that needed to be addressed. One in 10 were seated too close to the steering wheel. Approximately 20 percent did not have a line of sight at least three inches over the steering wheel. In addition, the majority of those responding to the survey indicated that as a result of taking part in the CarFit event, they made a change to improve the fit of their vehicles, their use of safety features in their vehicles and their willingness to discuss their driving with family or health care providers. Older drivers are often the safest drivers on the road, according to the National Highway Traffic Safety Administration. They are more likely to wear their seatbelts, and they’re less likely to speed or drink and drive. They are, however, more likely to be killed or seriously injured if they are in a crash because of their greater physical fragility. Driver safety programs improve adult driver safety by addressing cognitive abilities and skills. Cars, traffic rules and road conditions might well have changed since we first got our licenses, so such programs are an excellent idea. But older drivers can also improve their safety and the safety of others by ensuring their cars are properly adjusted for them. A little custom tailoring can make your car a better fit and help to make sure you have safe travels. For additional information, contact info@car-fit.org.